Environmental water in the Glenelg River triggered a marathon swim for one estuary perch in 2014–15, which made an upstream journey of more than 300 kilometres. Environmental watering has allowed native fish to move between important habitats along the Glenelg River and its tributaries. The estuary perch was able to get so far upriver due to a better connection of the freshwater part of the river to the estuary after fish barriers were removed, together with an increase in water flow. 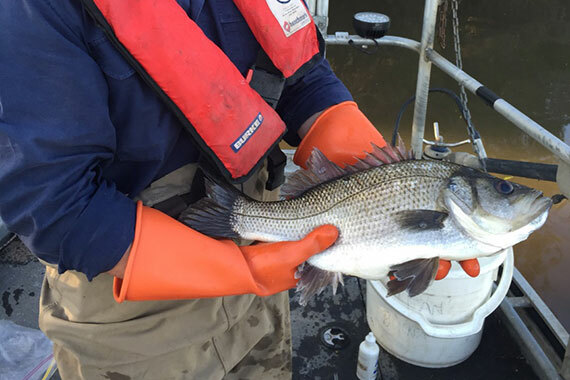 Bryce Morden, Water Resources Planner at Glenelg Hopkins Catchment Management Authority said, "It's great to see estuary perch returning to this part of the river following their disappearance from the area since the construction of Rocklands Reservoir in the early 1950s." According to monitoring undertaken by Glenelg Hopkins Catchment Management Authority, threatened native fish and key recreational native fish at more sites and in greater numbers in the Glenelg system following targeted environmental watering. "Environmental water releases from Rocklands Reservoir and associated riparian improvements along the river has seen native fish and other aquatic animals returning. Pygmy perch, blackfish, tupong and individuals from other native fish species have all been caught in high numbers. We also saw a large array of waterbirds, water rats and platypus," Bryce said. "Fish surveys have also shown successful breeding occurred through winter and spring, with young fish found at most sites along the river." "While these improvements have been encouraging, dry conditions through the late winter and spring meant that management priorities for 2014–15 shifted to maintaining the improvements achieved in recent years and preparing for dry conditions ahead." This story explains how environmental water is helping the region's rivers pull through drought.